Preheat oven to 350°F. Whisk 1/4 cup oil, 2 garlic cloves, and coarse salt in large bowl to blend. Add bread cubes and toss to coat. Transfer croutons to baking sheet. Bake croutons until golden brown, about 12 minutes. Cool completely. DO AHEAD Can be made 1 day ahead. Store airtight at room temperature. Combine cheese, mayonnaise, anchovies, vinegar, lemon juice, mustard, Worcestershire sauce, remaining 1/4 cup oil, and 1 garlic clove in blender; puree until smooth. Season dressing to taste with salt and pepper. 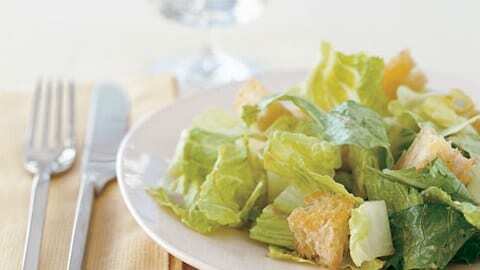 Place lettuce and croutons in large bowl. Toss with enough dressing to coat. Serve with any remaining dressing.